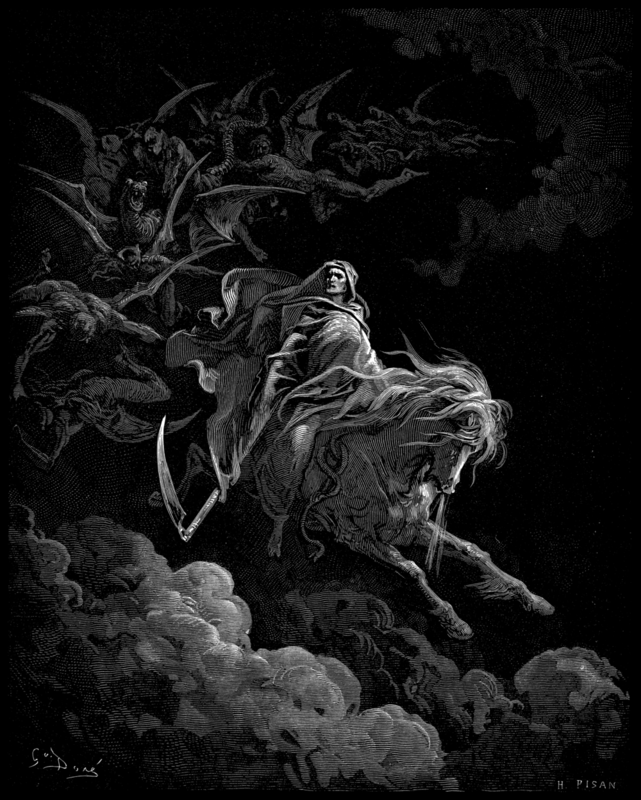 Above image is Death on the Pale Horse by Gustave Doré (1865). It is linked to Revelation 6:8 "The Lamb of God opens the seven seals of a book "written within and on the backside". After the opening of the fourth seal, Death rides into the world. He is the fourth knight of the apocalypse. Hell follows him." This work is in the public domain. And the flowers that grow between. — From the poem The Reaper and the Flowers by Henry Wadsworth Longfellow. First published 1839, in his collection of poetry entitled Voices of the Night. By Gustave Doré (1865). It is linked to Revelation 6:8 "The Lamb of God opens the seven seals of a book "written within and on the backside". After the opening of the fourth seal, Death rides into the world. He is the fourth knight of the apocalypse. Hell follows him." This work is in the public domain. La Calavera Catrina is a 1910–1913 zinc etching by the Mexican printmaker, cartoon illustrator and lithographer José Guadalupe Posada. The image depicts a female skeleton dressed only in a hat, her chapeau en attende is related to European styles of the early 20th century. Kirsty Clinch’s instagram photo of a strange dark figure in the alley outside the funeral home. The 1980’s era family photo from a trip to the Grand Canyon that revealed a strange hooded figure standing in the brush staring directly at the camera. Close up of the hooded figure. 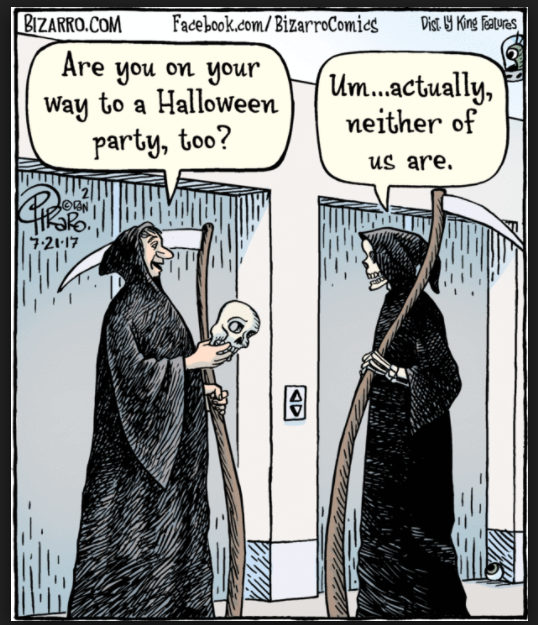 Gallows humor from talented comic artist Dan Piraro. 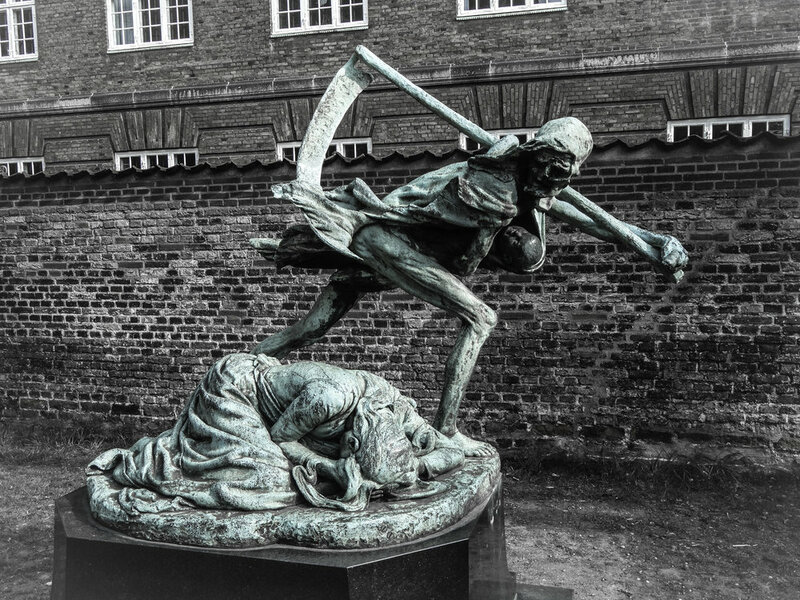 Home of one of many famous statues of the Grim Reaper (shown in our photos above). This particular statue features him holding an hourglass, but he has no scythe. When you hear the name, "The Grim Reaper," a very familiar image probably pops into your head. With the black robe and cowl, skeletal face and hands or the visage of a dour corpse, a threatening scythe, and hourglass at its last sands, this is the image the modern, western person thinks of when we personify death. But where did this visual come from? How do we know what death looks like? And since death has always been with us, isn't this image as old as that finality itself? One might think so, but that doesn't seem to be the case. Surely since there have been humans, we have wondered what becomes of us once we die, where do we go when we shuffle off this mortal coil, and how do we get there? What we have found is that yes, we have always created myths and put a face on death in order to help comprehend such an abstract and mysterious concept, but that face has morphed through the ages and varies by culture. 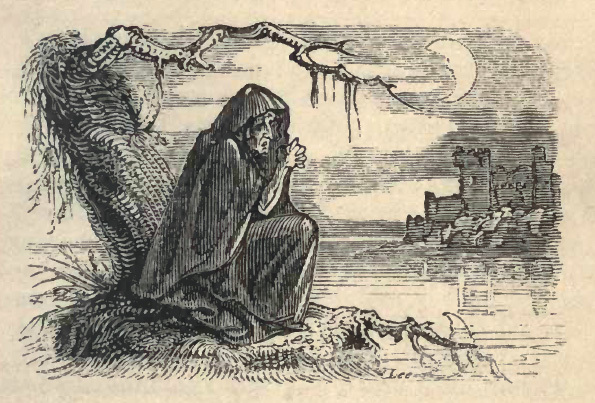 In the ancient western world, the concept of a Grim Reaper was more of a psychopomp, a guide that takes the freshly departed to their place in the afterlife. But since we have doubts nowadays when it comes to a more universally accepted idea of an afterlife, perhaps the notion of a ghastly specter that merely extinguishes our spark when our time has come is more relatable. And he's just a mythic character, right? A cartoon? Well not if you ask some folks who claimed to have seen him and lived to tell about it. Whatever the truth, in one sense, in the end, it doesn't matter if you believe at the moment of death that we are whisked away to another realm or it's just "lights out." As the saying goes, whether king or pauper, a Grim Reaper comes for us all. A modern Grim Reaper story on ThoughtCatalog, plus a bunch of other spooky tales! Is this the Grim Reaper lurking outside a Wiltshire funeral directors? – Fish n’ Chips Reaper! Episode 120: The Grim Reaper. Produced by Scott Philbrook & Forrest Burgess; Audio Editing by Sarah Vorhees Wendel; Ryan McCullough and John Bolen Sound Design; Research Assistance by Tess Pfeifle and the astonishing League of Astonishing Researchers, a.k.a. The Astonishing Research Corps, or "A.R.C." for short. Copyright 2018 Astonishing Legends Productions, LLC. All Rights Reserved.